A Christian body, Movement for the Kingdom Image (MFKI) has urged the government of President Nana Addo Akufo-Addo to enact laws that will make the defence of homosexuals a treasonable offence in the country. 'The Movement for the Kingdom Image (MFKI) wants to entreat the Akufo-Addo government to immediately enact a legislation that would make a mere defence of homosexuality a treasonable offence to control the unnecessary defence of the sacrilegious and abominable act of lesbianism and [gayness] by some unscrupulous individuals and groups in the country. 'We believe Ghana is not ready now or ever to accept this inhuman and ungodly behaviour, but the government must show its commitment not just by word of mouth but rather by a law that will restrict people from trying to defend the act. 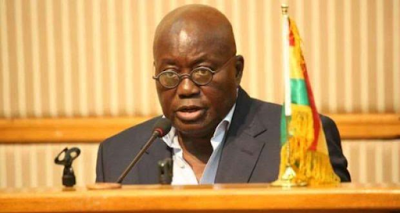 'His Excellency the president of Ghana Nana Addo Dankwa Akufo-Addo has all the powers either to accept or decline the legalisation of the act, therefore, we are appealing to the president to see the need to enact harsh laws to deal recklessly with those outcasts who want legalisation of homosexuality in Ghana".